Rugby, TN (July 16, 2018)—One way to beat the summer heat is to think about Christmas, and Historic Rugby’s offering everyone an early holiday gift with its new “Christmas In July” celebration on Saturday, July 28. The free event runs from 9 a.m. to 3 p.m. EDT (8-2 Central) in the heart of the Victorian English village founded in 1880, just off Highway 52 between U.S. 27 and U.S. 127. 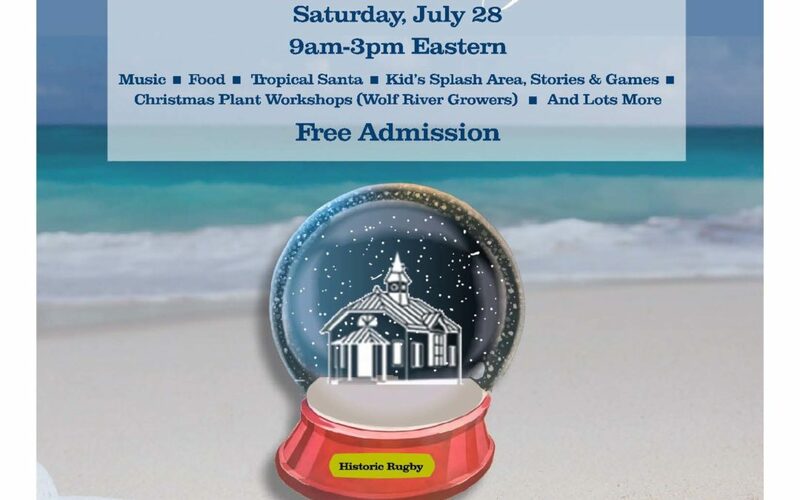 “Christmas In July” will feature food, vendors with holiday ornaments and decorations, workshops on holiday plants with Wolf River Growers, holiday music, and other seasonal fun. Shannon Terry, a local crafter from Morgan County, will lead a “Paint a Christmas Scene” class from 9-11am at the Community Building behind the Visitor Centre. Participants will paint an 11×14 scene in acrylics, all materials included for $35. Snacks will be provided. To register, visit www.historicrugby.org/xmaspainting or call 423/628-2441. There will also be a kid’s play area with a cooling water element, games, and other fun, including Santa Claus in tropical dress—and a special visit from Mrs. Claus. Historic Rugby will also be unveiling some new plans for its ever-popular “Christmas At Rugby” event held during the first two Saturdays of December. Christmas At Rugby draws visitors from multiple states, as the little Victorian village comes alive with holiday greenery, hundreds of oil lanterns, and volunteers dressed in period costumes sharing the history of Rugby. The café hosts a traditional holiday dinner, and there is music throughout the village from carolers and choirs and other performers. Rugby was founded in 1880 with the goal of building a strong agricultural community through cooperative enterprise, while maintaining a cultured, Christian lifestyle, free of the rigid class distinctions that prevailed in Britain at the time. The village has continued for 138 years, with numerous original buildings either restored or recreated. Learn more about the history of Rugby and its unique attractions at www.historicrugby.org.